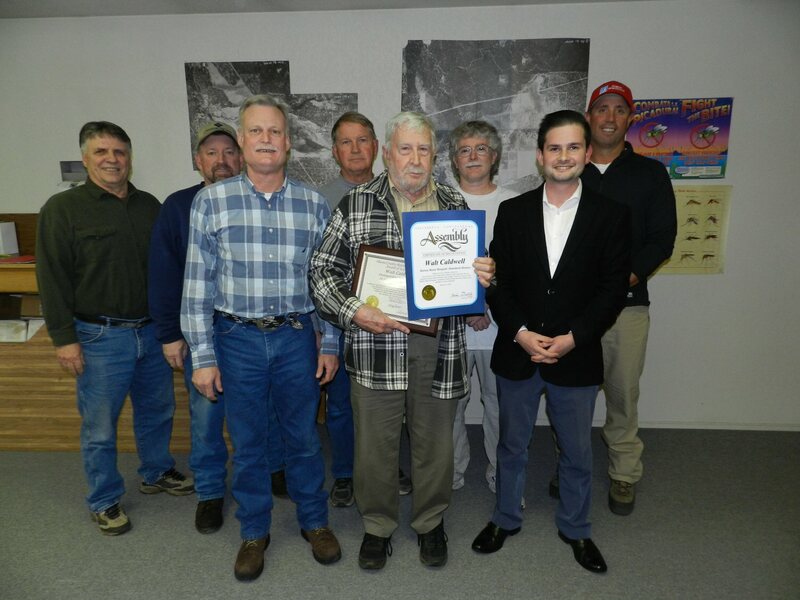 Walt Caldwell was presented with two awards at the March 14 Board Meeting of the Burney Basin Mosquito Abatement District. Caldwell has served on the board for 40 years. Thank you for a lifetime of service. Your service in the United States Marine Corps, and your time on numerous Special District Boards, most notably, your forty years on the Burney Basin Mosquito Abatement District Board, has truly made you a champion of the community. In difficult and challenging times your leadership was steadfast and unflagging, your dedication to the public good was powerful and pronounced. Through force of personality and extension of goodwill – cooperative relationships were established and flourished. You represent the very best in public service. Attending the ceremony were Current District Manager Rick Dougherty, longtime Chairman District Manager Mike Churney, Board of Trustees President Abe Hathaway, Board Vice President Chad Arseneau, Secretary Bill Ford, Trustee Dana Murray, and Walt’s wife Donna Caldwell. Thank you Walt for your service to the community!